Join Us!!! We are looking for someone to help us cover Dominican basketball. Please send us an e-mail. Last night (Wednesday) in the Lime National Basketball Finals which was played in front of a huge crowd of over five hundred persons plus saw the conclusion of the regular basketball season. Both series with records of 2-1 gave the possibility of two teams being crowned the champion of a division (Premier & Division 1) . The schedule for the evening were game one (1) Gloria Shillingford Raptors verses Raffoul Snipers and game two (2) The Glam X-Men verses Paix Bouche Eagles. And the fans who turned out in their numbers from Roseau, Wesley and Paix Bouche were not disappointed the games were played to a very high standard and a standard not seen in Dominica for a long time and adding to the overall excitement of a finals was the Premier game being carried live by DBS radio. Game 1- With good weather the fans from Wesley and Paix Bouche came down to support their teams Gloria Shillingford Raptors and Raffoul Snipers and they were on the edge of their seats or toes as the game went back and forth with lead changes. At half time the scores were Raptors 35 pts and Snipers 32, that slowly change by third quarter with Snipers taking a one point lead when the game entered the fourth quarter leading 48 pts to 47 pts. 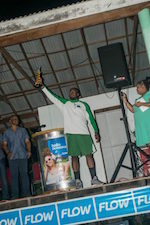 The game remained close untill the last minute when the Raptors took the lead and maintained to win the the game 73 pts to 69 pts and becoming the new 2010 Division 1 champion the first for Wesley which ended to spontaneous celebration with their sponsor Honorable Gloria Shillingford by their side. Game 2 - Which would decide a game five (5) or the new 2010 National Basketball Champion who will be able to represent Dominica as the champion team of Dominica in regional tournaments. The fans after witnessing the nail biting finish of the first game were only hungry for more great basketball excitement and they were not disappointed even after some technical breakdowns. The first quarter ended 23 pts to 23 pts with both teams feeling each other out but neither team could dominate or take control of the game . It remained tight and ended at half time with X-Men leading by one point 44 pts to 43 pts. The second half continued no different than the first half and remained tight with lead changes on a regular interval, then came the final quarter and both teams went to their big guns to take it home Garth Joseph and Davidson Toulon for X-Men and Andel 'Brad' George and Lynvor John of Eagles. At the end the X-Men won the game and became the new Premier Division Champion. The final scores were The Glam X-Men 80 points and Paix Bouche Eagles 75 points, top scorers for X-Men were Garth Joseph 27 pts and Davidson Toulon 19 pts while for the Eagles Andel 'Brad' George with a game high 40 pts and Lynvor John 19 pts. This concludes the regular season of the Lime National Basketball 2010 Season, the prize giving ceremony of the DABA is tentatively schedule for next week. The 2018 DABA/DOC Business League Regular Season has finally come to an end, and what a spectacular season it has been! The DABA would like to extend its deepest gratitude to all our participating business institutions for partnering with us. Your commitment and competitive drive has been nothing short of commendable and we trust that this league has helped to foster greater camaraderie within your respective business places and with the basketball community. This can only be a sign of greater things to come. Hats off to you! Congratulations to the top 6 teams who will be competing for the title in the Business League Playoffs, starting January 4th, 2018. We wish you all the best of luck and expect nothing less than intense competition and great basketball. As all teams have been informed, the top two teams will receive a bye into the second round, while the remaining four teams will compete for their spot in a 1-game knockout (see below for standings and playoff bracket). Seasons greetings, Merry Christmas, and a bright and prosperous New Year to all from the DABA! MIES, Switzerland - FIBA's official website FIBA.com has become FIBA.basketball after the International Basketball Federation on Thursday officially launched the .basketball domain name. FIBA is among the very few international federations to have applied and successfully secured the Top Level Domain (TLD) named after its sport. As a result, basketball's world governing body is now in a position to provide all of the sport's stakeholders and fans with a trusted and secure domain space that is consistent with industry standard service levels. FIBA Secretary General and International Olympic Committee (IOC) Member Patrick Baumann said: "The .basketball domain is ideal because it is clear, specific, has a global scale and reach and defines the sport. Ensuring that .basketball is kept within the sport for the benefit of the global basketball community is fully in line with one of FIBA's missions - that of bringing people together and uniting the community." The process to obtain the .basketball domain began in 2012, when FIBA partnered with Roar Domains, a US-based company focused on the commercialization of sports-related Top Level Domains, to submit its application. Aware of the fact that domain names including .com, .net and .org were reaching saturation point, FIBA and Roar Domains jumped at the chance of securing .basketball when the Internet Corporation for Assigned Names and Numbers (ICANN) was expanding the portfolio by making certain words available to the private sector as a generic top-level domain (gTLD). Following an extensive process, FIBA and Roar Domains were informed of the successful outcome of their application. Roar Founder and Chairman Ryan Nelsen congratulated FIBA on the launch of the FIBA.basketball website, and said it was a tribute to FIBA's vision for the future: "Creating a global digital identity for basketball is an historic step that will unify, protect and promote the sport for its Federations, Clubs, players and everyone in the Basketball community. We look forward to working with FIBA to strengthen the basketball digital identity online and strengthening links within the community." Roar Co-Founder Hamish Miller said: "FIBA's commitment to uniting and developing the basketball world with its powerful new domain makes them a great partner for Roar. We are delighted to be working with FIBA to enhance basketball community members' digital presence, identity and security through the .basketball domain." Accelerate the promotion of basketball and stakeholder brands in a controlled environment;Promote the sport and unify the global community online under a common banner;Make sure the rights of privileged basketball stakeholders are preserved;Link all participants via a specific identity and create a recognizable digital space for all basketball-related activities online. FIBA expects the global basketball community to embrace .basketball and is offering priority access to the domain names to its 213 National Federations and their members (leagues, clubs, players, etc.) as well as key stakeholders. The general public will have the chance to avail of the trusted and secure domain in 2018. The gloomy sky and sprinkles threatened to put a damper on the final of the President's Cup this weekend, but the show went on as planned. After having the first game between the St Mary's Academy and 767 Sports Under-17 teams called off with minutes left in the fourth due to rain (SMA was declared the winner 52 to 27), nobody was sure if the final would take place. But, to the delight of all the fans gathered, the veteran Fast Cash Prowlers, led by Julien Isles and Bernard Mills, tipped off against the youthful exuberance of the PSC Falcons at Massacre. The Falcons seemed to have the upper hand to start the game, but the Prowlers worked hard to put to rest any claims that the youthfulness of their opponents could out play or out last their experience. With less than a minute left in the fourth quarter, coming out of a time out, the Prowlers continued to play smart, composed basketball, pulling out the win 82 to 74. Julien Isles scored 29 points, Ronald Bruno 14 and Bernard Mills 13. In a losing, but impressive effort for Falcons, Kijuan Thomas had 26, and Peter Ricketts 17. Week one of the regular season will tip off on Wednesday at 7pm as the D-Tread Blazers and Thunderers go head to head in both Division 1 and Premier games. On Thursday, it will be the PSC Falcons playing 767 Sports at 7pm followed by Digicel Cloud against Lindo Park X-Men. All games will be played at Massacre.